Cannot be Normal Summoned/Set. Must be Special Summoned (from your hand) by having exactly 3 DARK monsters in your GY. You can banish 1 DARK monster from your GY, then target 1 card on the field; destroy that target. In the TCG, this card's first release is a Secret Rare, while in the OCG, it's simply a Rare, and so it is far less valuable despite its powerful nature. This is the DARK version of Armed Dragon LV7. This is one of the only two Dark counterparts of a LV monster, the other being Dark Horus. Just as the Horus and Armed Dragon archetypes came in the same set, Soul of the Duelist, their DARK forms came together in the same set of Phantom Darkness. At one time, this was one of the most sought after cards in the TCG, selling for as much as $250.00. This monster appears in the artworks of A Major Upset, Dark Mambele , Draconnection and Dracocension. This monster's Summoning condition is similar to the Special Summoning condition of Knight of the Red Lotus. This card cannot be Special Summoned from the Graveyard. : Please explain the details of Special Summoning "Dark Armed Dragon". Removing from play 1 DARK monster is a cost to activate the effect which destroys a card on the field. The effect targets 1 card on the field. You can activate the effect which destroys a card on the field multiple times during the same turn. "Dark Armed Dragon" can still be Special Summoned when there are Spells/Traps/non-DARK monsters in your Graveyard, as long as there are exactly 3 DARK monsters. 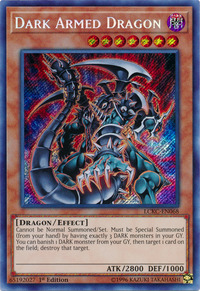 If "Royal Oppression" is activated to negate the Special Summon of a monster - like "Dark Armed Dragon" - from the hand, the monster is not considered to be on the field, so "My Body as a Shield" cannot be activated. : When "Royal Oppression" is activated when Special Summoning a monster, can "Royal Oppression" be activated? If "Transforming Sphere" is equipped with a monster like "Vanity's Fiend" or with a Special Summon Monster like "Dark Armed Dragon" that cannot be Special Summoned, then during the End Phase the effect to Special Summon the equipped monster to your opponent's field still activates. However, the monster cannot be Special Summoned, so it is sent to the Graveyard. Similarly, if you cannot Special Summon during the End Phase - for example, if the effect of "Vanity's Fiend" is active, or if you activated "Scapegoat" during this turn - then the effect of "Transforming Sphere" still activates during the End Phase, but the equipped monster is sent to the Graveyard since it cannot be Special Summoned. : What happens if "Transforming Sphere" cannot Special Summon the equipped monster during the End Phase? Number 16: Shock Master: If you declare "Monster Card", then you cannot activate the Ignition/Trigger/Quick/Flip Effects of monsters. You can still Normal Summon or Set monsters, and you can still perform Special Summons that do not use a Chain Link, like that of "Cyber Dragon" or "Dark Armed Dragon". Continuous Effects (which do not use Chain Links) are applied normally. : If Monster Cards are declared for the effect of "Number 16: Shock Master", then do things like Normal Summons become impossible? 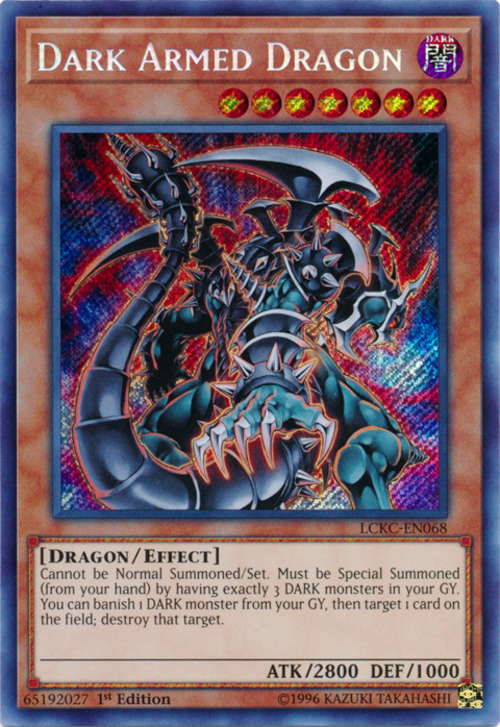 "Dark Armed Dragon" can still be Special Summoned while there are non-DARK monsters in your Graveyard. "Dark Armed Dragon's" effect that destroys 1 card is an Ignition Effect. Removing 1 DARK monster from play is a cost. "Dark Armed Dragon" cannot be Special Summoned from the Graveyard, even if it was properly Summoned beforehand. Horn of Heaven: "Horn of Heaven" can be used to negate the Special Summon of a monster with an inherent Special Summon effect that does not start a Chain, like "Dark Armed Dragon", . Prime Material Dragon: "Prime Material Dragon's" second effect works like "My Body as a Shield". "Prime Material Dragon" can negate cards such as "Dark Armed Dragon"
Solemn Judgment: "Solemn Judgment" can negate the Special Summon of a monster that is Special Summoned through its own inherent Special Summon effect that does not start a Chain, like "Dark Armed Dragon"